Does the chlorine in your pool irritate your skin and make your eyes burn? Do you want to reduce your chemical use? Aligator Systems have the solution. Does the chlorine in your pool irritate your skin and make your eyes burn? Do you want to reduce your chemical use? Aligator Systems have the solution. We are world leaders in using water ionisation techniques to purify water by killing algae and bacteria found in swimming pools and water systems. Fully automatic and self-regulating, Aligator offers substantial savings over conventional chemical treatments. Plus, the system reduces maintenance time and the need for chemical use by up to 80%. 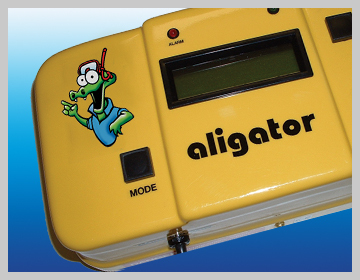 Aligator Systems are perfect for residential and commercial swimming pools, and have many other applications. By controlling waterborne bacteria and algae, the Aligator is ideal for water features, hot water systems, grey water holding tanks, aqua parks, water recycling and more. For eco-friendly water purification, Aligator is the natural choice. Contact us today.